Here are two ways that you can keep Faith's memory a little closer to you. We have selected thirteen pictures and created a Windows screen saver to brighten your day. A good reason to let your computer sit idle. Click on this link to download the screensaver "Images_of_Faith.scr". When prompted, choose "Save this program to disk" and click "OK". When prompted, select the C:\WINDOWS directory and click "Save". When the download is complete, click "Close". 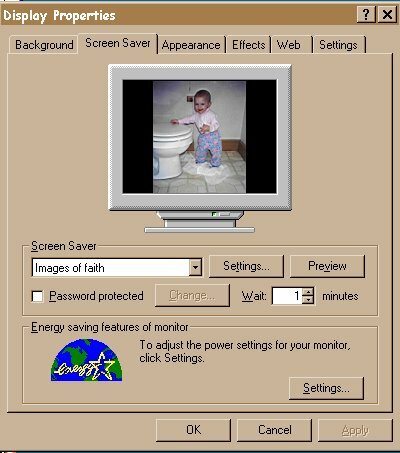 Screen Savers are set in the Display Control Panel. Right-click on a blank portion of the Windows desktop and select "Properties". Click on the Screen Saver tab. Select "Images_of_Faith" from the scroll-down list. Click "Apply" and then "OK". All of the images of Faith (plus a few more) are included in this self-running slide show. Click on this link to download the slideshow program "Images_of_Faith_Slideshow.exe". When prompted, select a directory on your computer (e.g., "My Download Files") and click "Save". In Windows Explorer, doubleclick on the downloaded file to start the slide show. Hit the Escape (Esc) key at any time to stop the slide show.